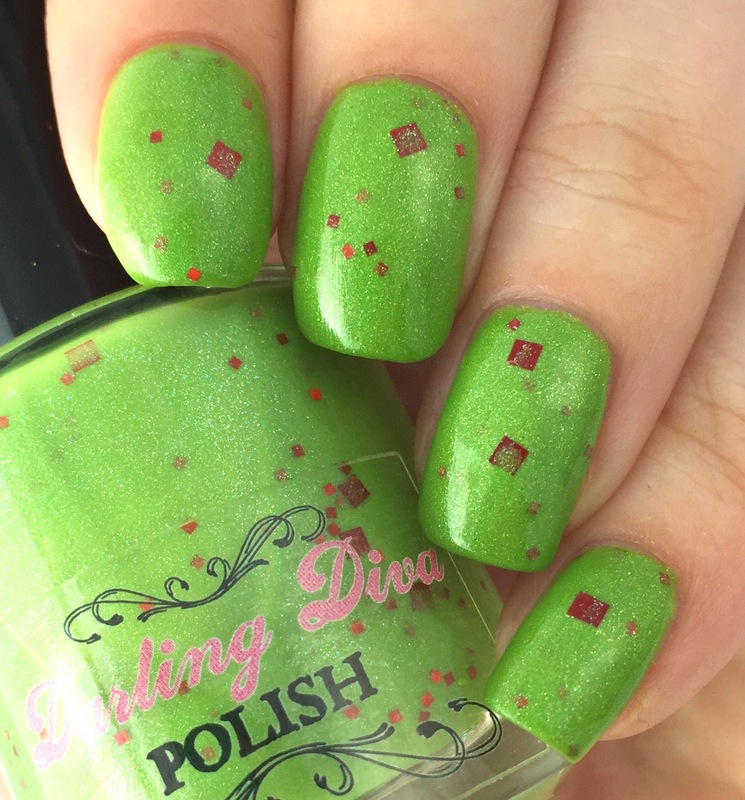 This is Darling Diva’s “Sheer Poetry,” a bright green holo with read square glitters in two sizes. For some reason, this polish strikes me as being Halloween-y. I think it’s the lime green base. I think it’s originally from a Christmas collection, though, which makes sense with the red and green color scheme. I went looking for this color online, and I’m pretty sure that my bottle (purchased a few months ago as part of a mystery bag) has a different formula than the original color of the same name. 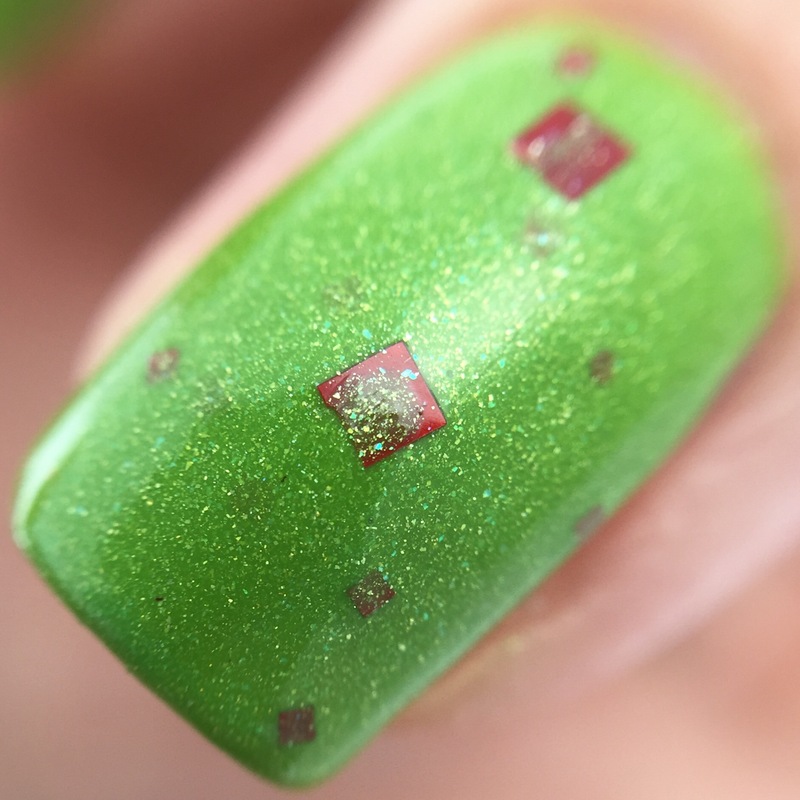 What I have is significantly more creamy and opaque, and much less holo, than older pictures I have seen online. Just a heads up! Even though the formula appears to be different than the original, my bottle is pretty darn good. This is two creamy coats- perfectly smooth, even with the glitter. It’s opaque enough that it covers in two coats, but also lets the glitter peek through. Gotta show off that square glitter! The consistency/viscosity is good as well: perfectly self-leveling and not too thick. 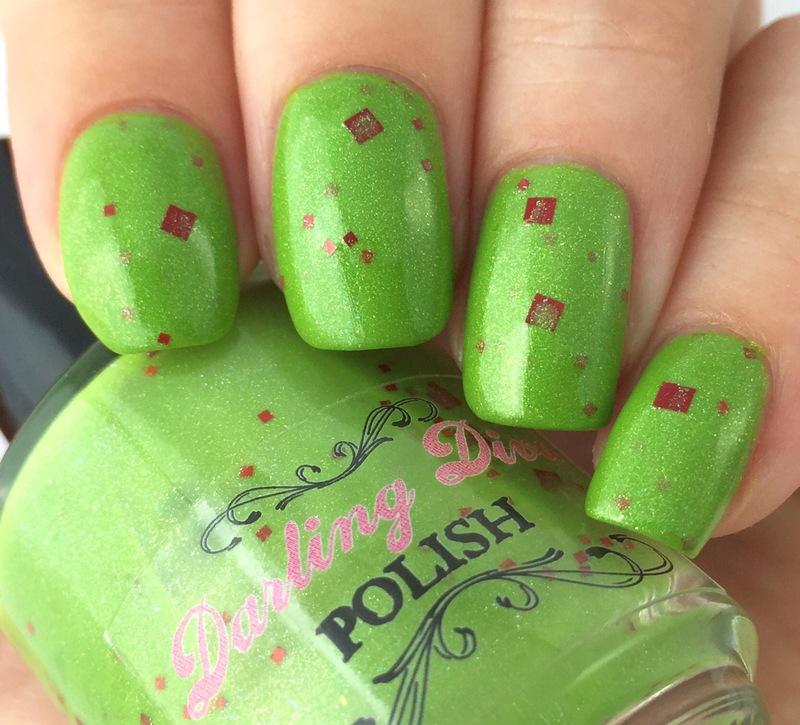 “Sheer Poetry” isn’t available on Darling Diva’s site any more, but there’s a lot of really cool holos and flakies over there right now! There’s also still mystery bags available with five polishes for $25 (which is how I got this polish. Im a big fan of mystery grab bags. So right after I took these pictures, I started making my dinner for the evening (there was hand washing in between)- dinner included Brussels sprouts which turn out to be the same color as “Sheer Poetry!” I couldn’t help but take a picture. It’s like the domestic lunatic’s version of those glamorous posed shores with fancy props. 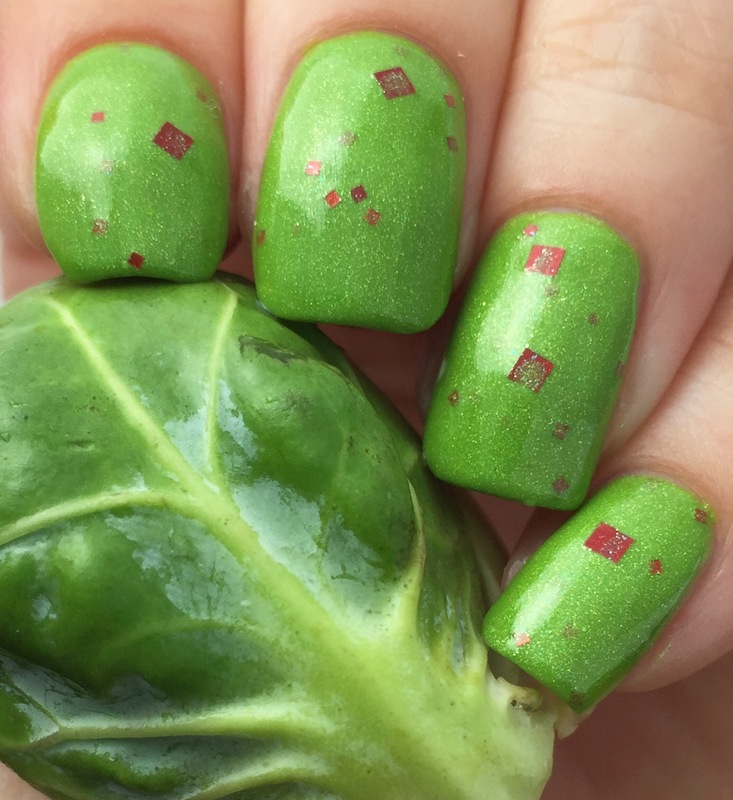 I love that you used the Brussels sprout! You’re right, though. This doesn’t scream Christmas to me either. Someone I don’t remember that one but the base color is awesome! I definitely think this is more Halloween than Xmas too haha. But it’s a great color to glitter combination. Classic color combo here, without looking to much like Christmas. The shade of green really makes it feel more halloweeny than Christmas to me. haha What a beautiful polish! The use of the brussel sprout as a prop is great! I like that this shade works for either Halloween or Christmas. It isn’t too strongly one or the other. Love it!